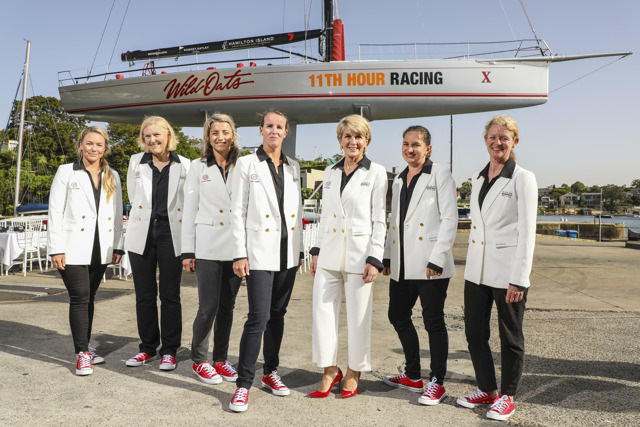 The 13-strong crew, led by Skipper Stacey Jackson and supported by team Ambassador the Honourable Julie Bishop MP, will race under the team name of ‘Ocean Respect Racing’, in partnership with 11th Hour Racing, an international organisation that promotes sustainability through sport. Sailing on the 66 footer Wild Oats X, Ocean Respect Racing is a serious contender for victory with a combined experience of 68 Rolex Sydney Hobart Yacht Races and 17 Volvo Ocean Races. Working closely with Ms Bishop the crew has commenced intensive preparations to be ready for the iconic race. Ocean Respect Racing’s crusade to Hobart became a reality at Hamilton Island Race Week in August 2018, when Sandy Oatley gifted Stacey Jackson the use of Wild Oats X for the race on behalf of the Oatley family. Wild Oats X is the sister ship to super maxi Wild Oats XI, which has been decorated with line honours in the Rolex Sydney Hobart Yacht Race a record breaking eight times. Both Wild Oats yachts are confirmed to be on the starting line, adding to the fierce line-up of competition expected in this year’s race. Stacey Jackson, Skipper and Founder of Ocean Respect Racing said that the crew were looking forward to the race. “To be able to sail with a fully professional all-female crew to Hobart is a wonderful opportunity and we are proud to build on the work of non-professional female crews who have previously raced. Our crew will be training intensively in the lead up to Boxing Day and we are excited to sail to promote and encourage women in the sport, and to engage with the Australian public on ocean health issues that are affecting us daily, both locally and globally. We are working with the sailing community to further educate ourselves, be proactive in mitigating our impact on the ocean, and to encourage others to consider ocean health and sustainability.” Ms Jackson said. Sandy Oatley said when Stacey presented her proposal to enter Australia’s first all-female professional crew in to the race, the Oatley family instantly decided to support Stacey’s campaign. “Sailing is a sport that my family is incredibly passionate about and we were delighted to agree to contribute Wild Oats X to Stacey’s campaign at Hamilton Island Race Week. We are looking forward to seeing both Wild Oats XI and Wild Oats X on the starting line for what is expected to be a strong race. ” Mr Oatley said. "We are thrilled to continue our work with Stacey Jackson in the Rolex Sydney Hobart Yacht Race, building on her legacy with Vestas 11th Hour Racing and the Volvo Ocean Race.” commented Rob MacMillan, Co-Founder of 11th Hour Racing. Since 2010, 11th Hour Racing has been harnessing the power of sport for positive change with an innovative approach through strategic partnerships within the sailing and maritime communities – including the Volvo Ocean Race and the America’s Cup, along with giving over 80 grants to not-for-profit organizations, and engaging professional sailors as global ambassadors. Ocean Respect Racing will be promoting the UN Environment’s Clean Seas campaign, a grantee of 11th Hour Racing, growing the momentum of Australia’s recent commitment to the campaign to reduce ocean plastics.